I wouldn't contemplate cosmetic surgery but I do need a little make up to make myself feel look good. This make up bag contains my make up, brushes, sharpener, mirror and even eyelash curlers. Not very minimal in style, I know, but I'm not going to worry about that and everyone owns something by this lovely bag lady. So along with the larger decluttering projects of the past two years, I have also tackled smaller clutter hotspots - such as my make up bag. So... how did I do it? I amassed all my make up items and set about streamlining them. This took several attempts but each time it became easier. I asked myself various questions about the quality, suitability and condition of each item. Luckily with this sort of decluttering there are no items to sell or donate - just bin! My aim was to eventually fit all my make up and related gear into one bag - this was quite a challenge. My hoard of make up not a pretty sight - unfathomably dated, sometimes broken products and caked in goodness knows what. Searching for a particular colour of eyeshadow or lipstick was always an arduous task and never worth the effort. When you own too much and it has to be housed in multiple storage places, or worse than that plastic bags, you are unnecessarily overcomplicating things. You know I wasn't always like this and the process of sifting through surplus make up products was not easy. But I love the fact that I've streamlined this area of my life and now finding my make up and applying it is a breeze. Yay! Remember you can't declutter your life overnight. 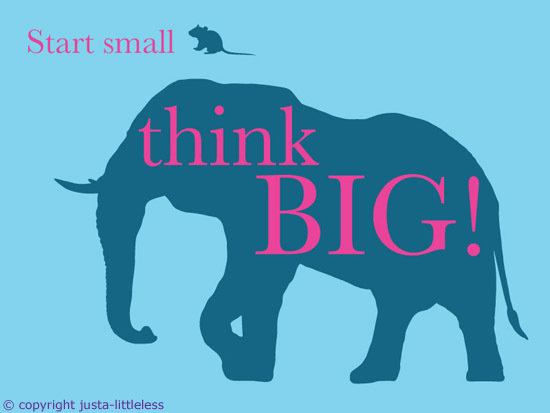 Start small think BIG!